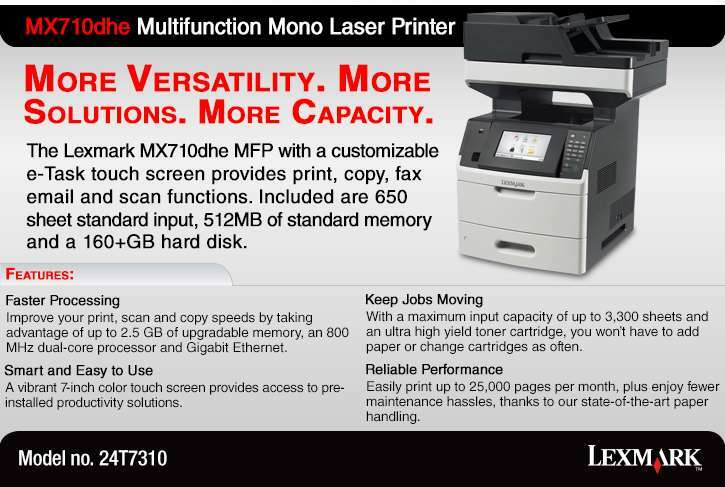 Enhance your printing experience with the Lexmark MX710dhe 24T7310 MultiFunction Printer. This wonderful printer takes care of all your printing, copying, faxing, email and scanning functions. With its Dual-Core 800MHz processor and 512MB memory, it lets you manage heavy workload very easily. It also has a large storage capacity with its 160GB HDD. Get superior quality prints using its Monochrome Laser technology. The Lexmark MX710dhe 24T7310 MultiFunction Printer supports 1200 x 1200dpi resolution letting you enjoy clear texts and images. It uses 63 ppm print speed letting you print very fast and also is designed with duplex printing utility to conserve energy using very less paper. 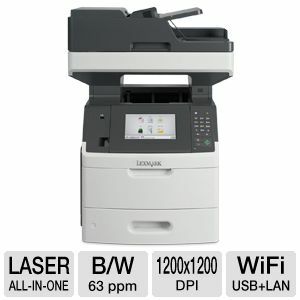 It is equipped with 802.11 b/g/n Wireless Ethernet to give you access to online printing very fast. It ensures immediate set up with its USB 2.0 feature. Purchase the Lexmark MX710dhe 24T7310 MultiFunction Printer immediately.